No one knows exactly how these swords were made. 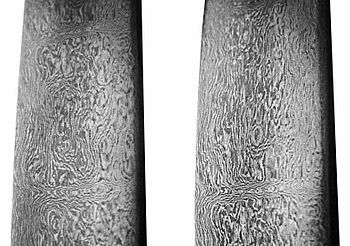 Doing some research on manufacturing swords, I stumbled across Damascus Steel, a process for creating blades from mixing iron, steel and charcoal in multiple layers. The process, popular in India and the Middle East, resulted in swords that were sharper and more durable than other weapons of the time. Recent studies have shown that the process resulted in creating carbon nano-tubes, which is one of the reasons it could maintain an edge so well. While there is a lot of information on how to approximate the process today, nobody knows exactly how it was done. Beautiful pattern, creating mythical superior swords? That’s the sort of stuff story gold is made for. Considering we were insistent swords make it into our space opera, having ‘cool’ be synonymous with ‘better’ makes one all sorts of excited. Of course, modern alloys are even better. But the fun part is that if combining ingredients from different location in a top secret process worked in the real world, there’s real juicy inspiration there for anyone writing a story.